In This Spot. . . Mine just started again, too - it appears to be on a rotating basis, however. The light! It's coming back and with it, the eggs! I wish mine would start laying! I miss those eggs! But they're too young yet, I've got to wait until April. I started a whole new batch in October. The previous batch is in the freezer!! Patience, my dear, is its own reward. "Every egg a masterpiece," that's our motto. Not to toot my own horn, but isn't that brown one a beaut? Hey, wait- homesteadherbs: Whatcha mean in the FREEZER? I know you're not freezing eggs! Victory in a shell! That'll teach those other snobby little feathered things, pah! W&L just needed some TLC. I bet the eggs in the freezer are mixed into something yummy. My neighbor chickens have laid all winter long -- not very much -- hit and miss alot. Now that the days are getting longer they will lay more. Look for more eggs over the next few days.. hopefully they will start a trend. Oh -- chickens can be clannish creatures. They will kill new additions to the flock -- even adult birds. My neighbor chickens kill all their babies and they even go after the cocky rooster who chases my cats. My neighbor says he's never seen a bunch as bad as these girls. oh lucky you, fresh eggs! i love anticipating the coming season. congratulations! 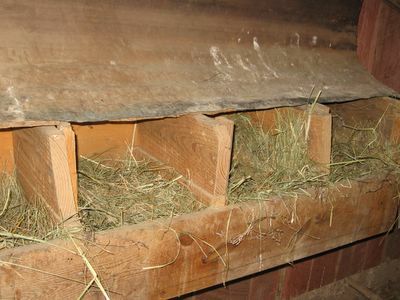 You're taking me back to my childhood and teenage years when it was one of my chores to collect the eggs from the chicken nests in the barn. I kind of remember that with a bit of fondness. I also loved the picture of the sheep in an earlier post of yours. One of my brothers back then raised sheep as his hobby. I would love to have chickens. Actually, chickens and goats. I envy you Farmgirl! lucky you, I love the feel of warm freshly-laid eggs, it's an incredible feeling holding it in one's palms. I envy your fresh eggs. I can get them but I have to plan for it and it's not convenient. It sure is tough when those fresh eggs disappear (hear that Lindy & Whitey????). We are fortunate to have a place to buy other peoples' farm eggs when our chickens aren't laying. When I used to get 100 eggs a week (those were the days), I sold the extras to our little "local" (32 miles away) natural foods store. When I'm out of eggs, I can usually find somebody else's eggs that are almost as good as mine for just $1.50 a dozen. "Every egg a masterpiece?" Oh geez. I think maybe I'd just better not say anymore right now. Wouldn't want to upset your fragile dispositions and lose production now that we finally have it! P.S. I don't think homesteadherbs put her eggs in the freezer either. P.P.S. And don't think a few eggs from you and Whitey are going to keep us from ordering a couple of dozen chicks this spring. *peep* *peep* And so cute, too! Ha ha, I loved reading about your childhood hunt for goose eggs. That must have been so much fun. And no (at least for me anyway), the thrill of finding eggs does not diminish with age! "Victory in a shell!" I love that! Yes! It certainly was a victory--at least a few more eggs before they head up to wreak havoc in that great henhouse in the sky. Okay, but wait a minute. Whitey & Lindy just needed some TLC? Some TLC? Are you kidding? That is some pampered poultry out there. I know you must be kidding. Yep, chickens are not nice birds. I had no idea before I started raising them. It's downright scary. One speck of blood on a chicken in a group and, well, it's pretty gross. So what kind of eggs can you find in Athens? 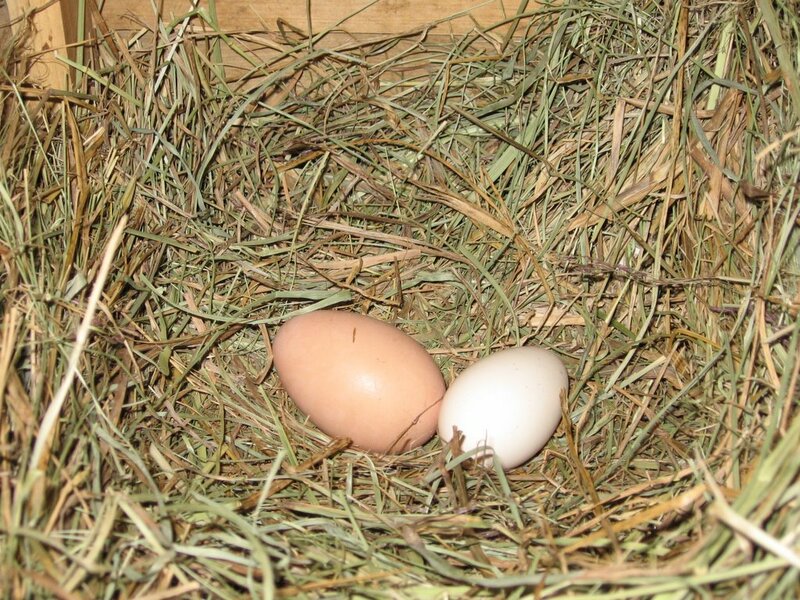 Yes, there is nothing like the warmth of a freshly laid egg. And I never knew until I had my own hens that when an eggs comes out, it is actually wet because it is covered with a protective coating that quickly dries. This is why, if you are going to store your eggs (eggs last for months and months), you do not want to wash them because that washes off the protective coating, thus allowing bacteria or whatever to permeate the shell. Another interesting fact is that as eggs get older, they lose moisture so there is less white inside an older egg than in a fresh one. And one more egg bit of trivia while I'm on an egg roll (sorry, couldn't resist)--it is nearly impossible to peel freshly laid eggs after they have been hard-boiled, and it is also nearly impossible to whip eggs whites for meringue when they are very fresh. Hehehehe....the chickens are in the freezer!!! Not the eggs! And the chickens sure taste tasty!! 100 eggs per week! WOW! How many hens did you have? 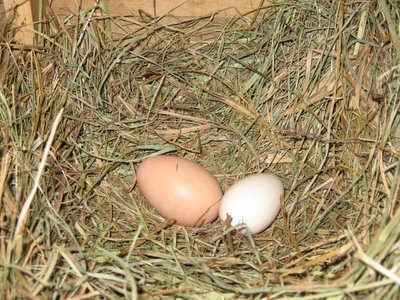 Please help this city girl -- what kind of hen lays the big, brown egg, and what kind of hen lays the little white egg? bb: That lovely brown one is mine, thanks. homesteadherbie: Better make sure those chickies don't find out about the gruesome contents of yr freezer! Poultry can be very sensitive. And when we're upset, sometimes we stop laying those eggs, dear. susan, sweetie: The house gig sounds good; do I get an easy chair? I mean, of course, if dear Whitey should, ahem, pass before me. baking soda: What an understanding girl you are. Have you met Pablo? In my experience, farm fresh eggs can last for several months, although they are best when used within a month or so. Also, if eggs have been refrigerated at all (say, at the case in the natural foods store for a day or two), then they need to stay refrigerated.